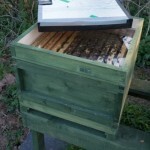 Crownboards cover the hive under the roof and are typically ply with one or two holes designed for feeding and/or Porter bee escapes. Since the most basic function they serve is to prevent the roof being propolised down they can be as simple as a sheet of thick polythene cut to size. The semi-translucent stuff they wrap new furniture in is particularly good. Assuming bottom bee space this can be laid across the top of the frames, easily peeled up for inspections and discarded once it gets too messy. With good insulation above, condensation is not a problem. However, I prefer crownboards that are rigid with inbuilt insulation, that lack holes and that allow me to see the colony with the minimal possible disturbance – for example during autumn feeding. For a few years I have used Perspex crownboards. These need insulating to avoid condensation so more recently I’ve been building reversible Perspex crownboards with inbuilt insulation. Build a square (flat and true … by clamping it to a 46cm square template of thick plywood) eke out of 46 mm x 21 mm softwood, using simple screwed and glued joints. Cut 4mm thick Perspex or polycarbonate to 46 cm square. Don’t be tempted to use 2mm Perspex, it tends to warp and this ruins the resulting bee space. Use a strong sharp knife and a metal straightedge to carefully score the Perspex deeply and then (with a surprisingly hard) sharp blow, break it along the scored line. This is easier if you clamp the sheet to a table edge, using a piece of wood to hold the sheet down and prevent it from moving. Place the Perspex on top of the eke and then cut four strips of 6mm thick softwood ~45cm in length to create the bottom rim of the cover board, overlapping slightly at each corner. Note that 9 mm is too thick and usually results in some brace comb being built on the underside of the Perspex. With the rim in position use a 3mm bit to drill through the thin rim and just mark the Perspex – you probably need 2-3 holes per edge. Remove the softwood rim, but keep a record of the order they were in as you will need to put them back in exactly the same positions. Remove the Perspex and drill through it at each drill-marked point using a 5-6mm bit. This is critical. If you screw the rim in position through a hole in the Perspex that is too small you will inevitably crack the Perspex. Put the Perspex and the softwood rim back in their original positions and fix the latter in place with 4mm x 30mm screws. Now for the insulation. Kingspan and most other expanded foam-type insulation is available in 50mm thick sheets. Kingspan is particularly suitable as the foil cover makes it a bit more robust. It can be easily cut with a sharp knife. Cut the sheet to size to fit within the thick rim of the cover board. Use gaffer tape to seal the edges of the insulation and to create two simple ‘handles’. Finally, fix an additional rim of 9mm x 21 mm softwood around the thick (upper) rim so that it is deep enough to accommodate the Kingspan. 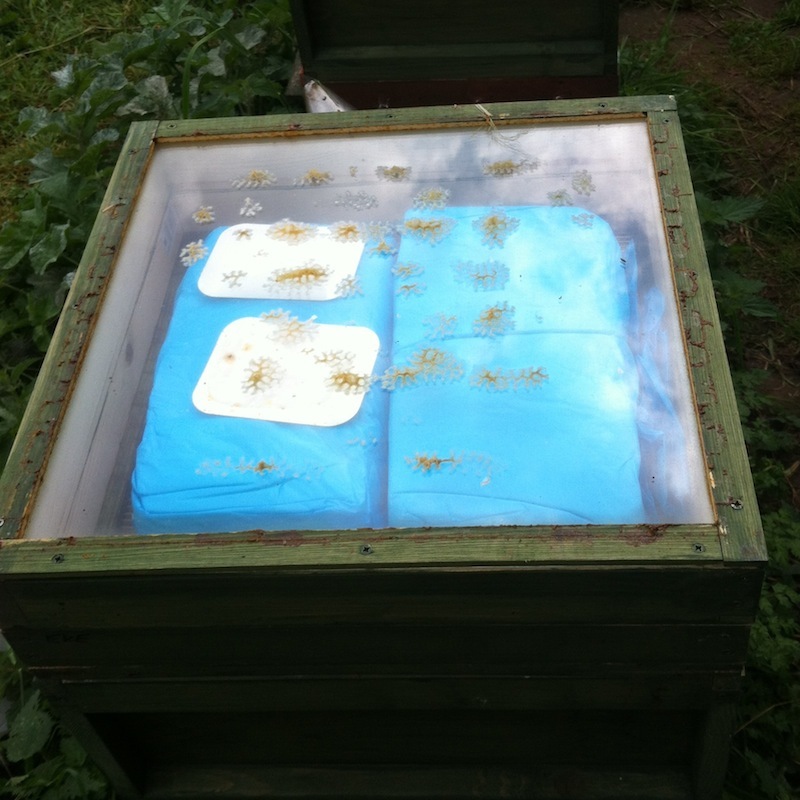 In normal use the Perspex sheet is placed immediately over the brood box and the insulation can be lifted out to view the colony. 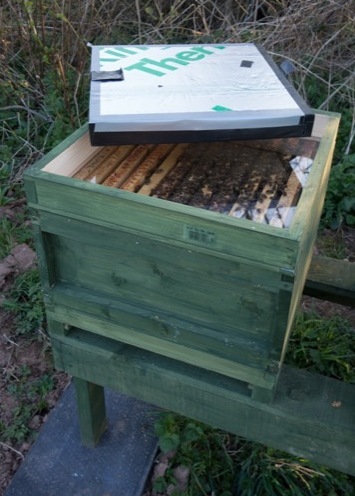 For Apiguard treatment in the autumn or feeding small blocks of fondant in the spring simply remove the insulation and reverse the crown board. Put the insulation on top and replace the roof. If you use fondant in the autumn the addition of a separate 46mm eke below the reversed crown board gives sufficient space to accommodate a single 12.5 kg block split into two halves directly on top of a queen excluder. The bees will usually eat enough within a couple of weeks to allow the removal of the eke. 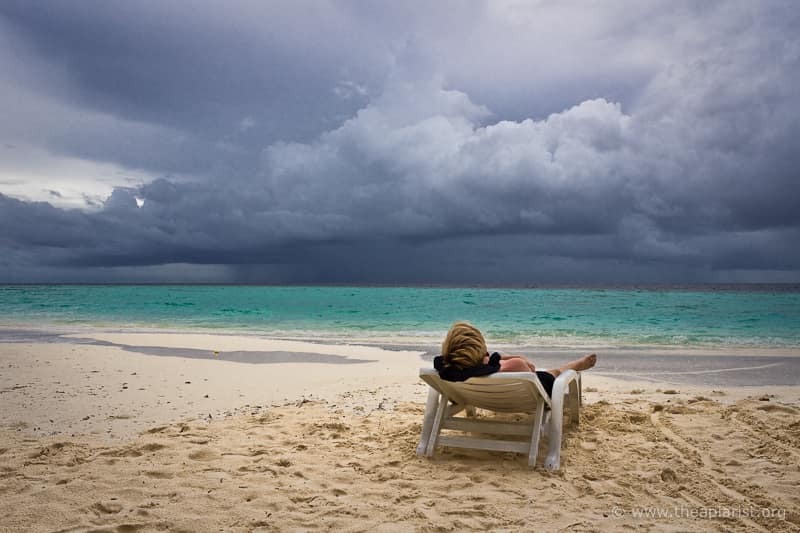 Once it’s all gone, remove the empty plastic bag and the QE and reverse the crownboard. 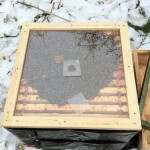 In mid-winter you will usually find the cluster immediately below the Perspex – the warmest spot in the hive. This image (left) shows an older style simple Perspex crown board (with a blocked feeder hole, something I now omit) from which the 50mm Kingspan insulated cover has just been removed. Despite the sub-zero temperatures there is no condensation. 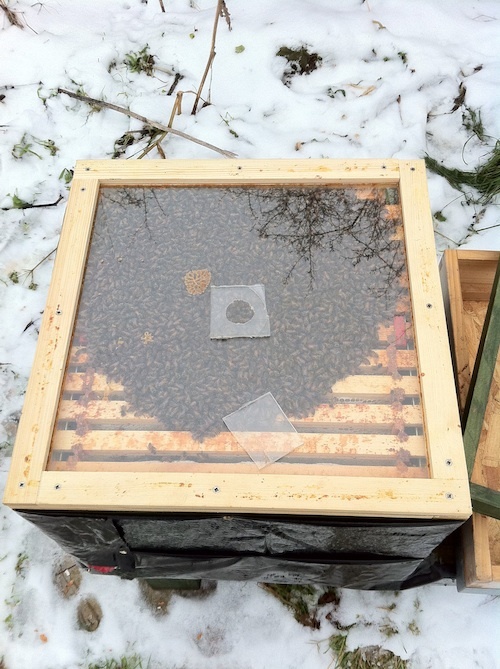 This entry was posted in Beekeeping, Boards, DIY and tagged DIY on December 22, 2013 by David.